LONDON, England (CNN) -- Britain's Prince Harry will not serve in Iraq as a troop commander because of "a number of specific threats" against him, the UK's top general says. A spokesperson for the 22-year-old prince says he is "very disappointed" by the decision. "There have been a number of specific threats, some reported and some not reported. These threats exposed him and those around him to a degree of risk I considered unacceptable," he said. Wednesday's announcement reverses a statement made in February by the Ministry of Defence and the royal family, which said that Harry would be sent to Iraq with his regiment. Dannatt commended the prince on his determination. "Let me also make quite clear that as a professional soldier, Prince Harry will be extremely disappointed. "He has proved himself both at Sandhurst and in command of his troop during their training. I commend him for his determination and his undoubted talent -- and I do not say that lightly. His soldiers will miss his leadership in Iraq, although I know his commanding officer will provide a highly capable substitute troop leader." A statement issued by a spokesperson for the prince said: "Prince Harry is very disappointed that he will not be able to go to Iraq with his troop on this deployment, as he had hoped. He fully understands and accepts Gen. Dannatt's difficult decision, and remains committed to his army career. Prince Harry's thoughts are with his troop and the rest of the Battle Group in Iraq." Harry would have led a troop of 12 men in four Scimitar armored reconnaissance vehicles, each with a crew of three, in the southern Iraqi city of Basra. He is a 2006 graduate of Britain's prestigious Royal Military Academy Sandhurst and has been actively seeking the posting in Iraq. Harry's older brother William -- while also a military officer -- is not eligible for combat service because he is the second in line to the British crown. Harry has repeatedly said that he wants to be deployed with his men, but ministry officials have expressed concern that he could become a target for Iraqi insurgents, endangering himself and those serving under him. Royal commentator Robert Jobson told CNN that it would be a "disaster" for the British Army if Harry was targeted by militants. Jobson said he did not believe Harry would quit the army, despite being kept out of Iraq. Harry would have been the first member of the British royal family to serve in a war zone since his uncle, Prince Andrew, flew as a helicopter pilot in the Falklands conflict with Argentina in 1982, The Associated Press reported. Prince Harry, whose regiment is due to be deployed in Iraq, is "very disappointed" he will not be joining them. Your e-mails: Should Harry have gone to Iraq? 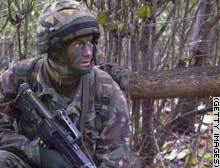 Is the British army right not to send Prince Harry to Iraq?